The San Diego arts community is thriving, thanks to innovative installations such as the one that Christie and Spinitar, working with TruClear Global and Tempest, have installed on the south façade of the InterContinental San Diego hotel, using Christie HS Series projectors and a Christie Pandoras Box media server. 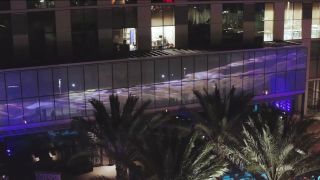 The end result is a permanent digital art display called “Liquid Light,” a large-scale projection mapping by artist Roark Gourley that celebrates the coastal location of the new hotel. The digital art display is a combination of under- and above-water images, complete with slow motion and special effects, showcasing an abstract visualization of the concept of humanity in liquid motion, the beauty and flow of sea life, and the interaction between the two. InterContinental San Diego is located in downtown’s coastal BRIC complex (Broadway and Pacific Highway) and wanted to embrace the unique culture of the waterfront neighborhood by integrating it into a public piece of art. To meet permit requirements of the city, which require developments to incorporate art into the landscaping, the hotel decided to create a digital art display in collaboration with artist Roark Gourley and general contractor Hensel Phelps. Christie was brought on board, and then tapped Spinitar to provide AV integration and system design. Spinitar said the biggest challenge was projecting onto the double-paned partially frosted glass on the hotel’s windows. However, working with TruClear Global, a protection film was applied to retain the images on the glass without distortion. And the Christie HS Series projectors performed admirably, handling the unknown factor of how ambient light would vary and affect the image, during the planning stage of the project. Christie and Spinitar demonstrated a selection of projectors for the project, and ultimately five Christie HS Series 1DLP laser projectors were selected. Christie Pandoras Box Player, Manager, and Widget Designer are used for blending the projectors, mapping the content and as the media server for the 17-by-145-foot-high permanent installation. The display runs seven nights a week, year round.